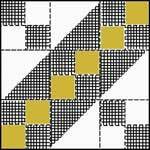 This fun quilt block's name of Beggar Block comes from the custom of begging friends and neighbors for fabric scraps, old neckties and dresses to use in creating a quilt. 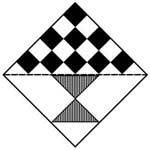 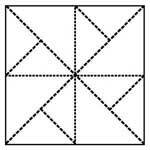 Triangles are pieced together to form oblongs that match in size to the plain fabric rectangles. 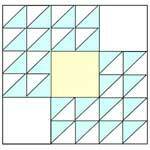 Two of the triangle oblongs and one plain rectangle are pieced together for each square. 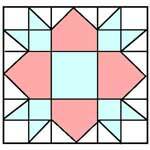 Eight of these pieced squares and one plain colored square are sewn together to create a nine-block square that's 11-inches square. 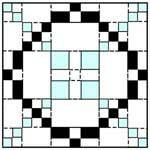 This quilt is made from 36 pieced blocks, set together with 11-inch wide strips. 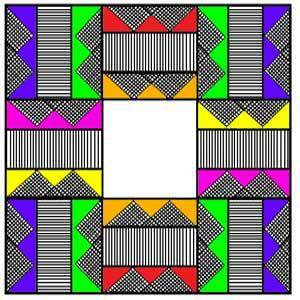 The ends of the strips are completed with plain squares and strips on the top and bottom are added to frame the unit. 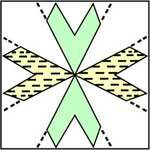 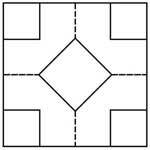 Click on image to print the 5" block of the Beggar Block quilt pattern.